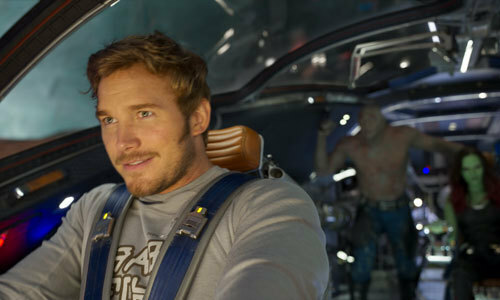 Peter Quill/Star Lord hopes to find his father in Guardians of the Galaxy Vol. 2. Will he learn that fellow Guardians are his true family? Are Blu-ray extras fun? Check out Kidzworlds review! In Guardians of the Galaxy Vol. 2, the gang is famous after saving the galaxy once before and they are hired for various near impossible missions. 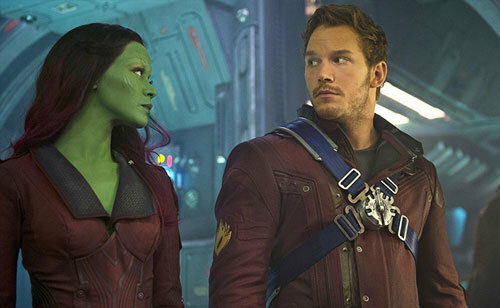 Peter Quill/Star Lord (Chris Pratt) is still loving the adventure and still hot for Gamora (Zoe Saldana) but something is missing in his life. He searches for his mysterious alien dad. Will he realize that fellow Guardians are his true family? On Earth, in Missouri, circa 1980, a good-looking stranger is courting a beautiful Earth girl. He plants a weird alien plant in a remote locale. They seem in love; the result? Baby Peter Quill later known as Star Lord. 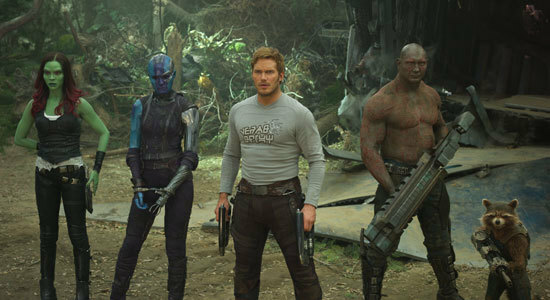 Now, Peter Quill, Gamora, Drax (Dave Bautista), Rocket (voice of Bradley Cooper) and Baby Groot (voice of Vin Diesel) are respected as heroes and are hiring out for difficult tasks. 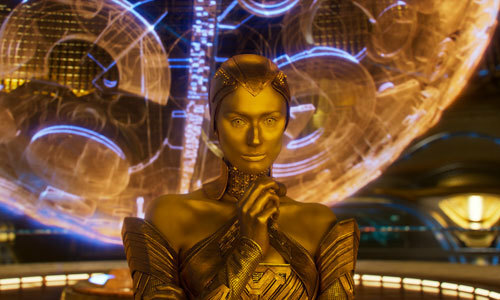 Golden-skinned Ayesha (Elizabeth Debicki), High Priestess of the Sovereign race, hires them to keep a ginormous, squid-like monster from another dimension from stealing special “batteries”. 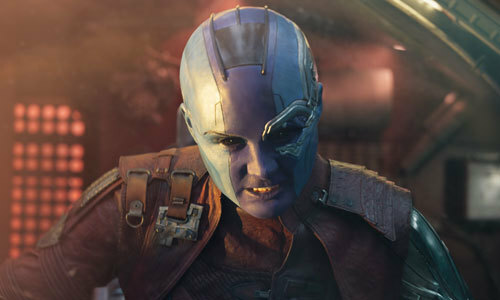 In return, they are to get custody of Gamora’s sister Nebula (Karen Gillan), who was caught trying to steal the batteries earlier. 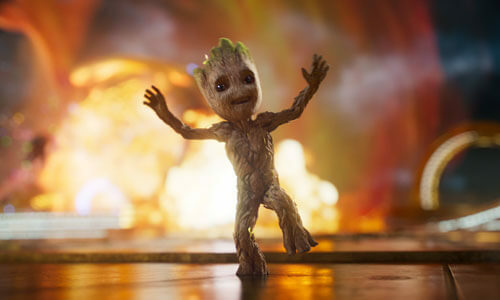 Baby Groot, oblivious to the battle with the mega-squid behind him, dances joyfully to Quill’s music and little Rocket wants more in payment than the return of Nebula so he steals a few of the batteries which really ticks off Ayesha who then launches a fleet of drone ships to attack the Guardians’ ship the Milano. The drones are destroyed by a mysterious figure but the damaged Guardian ship crash-lands on a planet. 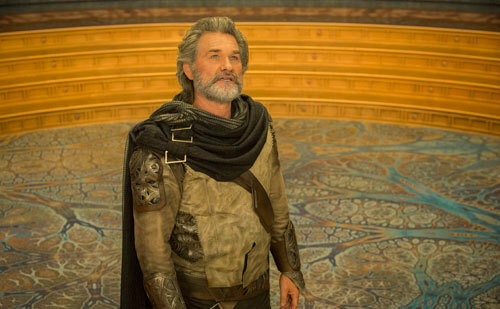 The savior of the Guardians turns out to be Ego (Kurt Russell), Peter Quill’s dad who takes Quill, Gamora and Drax to his home world while Rocket and Groot remain behind to repair the ship and guard Nebula. Quill and pals meet Mantis (Pom Klementieff) an empath raised by Ego whom he values for her ability to help him sleep. Meanwhile Yondu (Michael Rooker) who took Peter Quill from Earth and raised him to be a thief, has been banned from the big Ravager community by head Ravager Stakar (Sylvester Stallone) for stealing and selling children, Peter included. 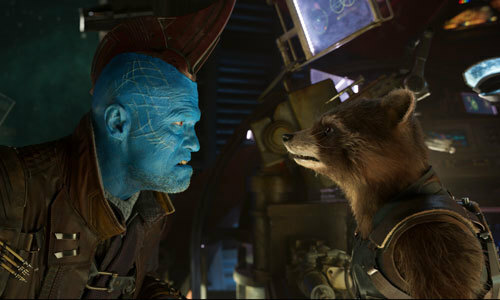 Ayesha hires Yondu and his crew to recapture the Guardians. They grab Rocket but Yondu doesn’t want to capture and give Quill to Ayesha. His second in command Taserface (Chris Sullivan) leads some of Yondu’s crew in a mutiny takeover with help from Nebula who is still out to kill sis Gamora, blaming her for torture from dad Thanos when she was young. Baby Groot, finally frees Rocket and Yondu and they all escape but before dying, Taserface tips off Ayesha and her new Sovereign fleet of ships. Ego tells Quill he is one of the god-like, pure energy Celestials. He can assume many identities and has traveled to many planets eventually meeting and falling for Quill’s mom Meredith. When Meredith died, Ego hired Yondu to grab young Quill and bring him to him but he never turned the boy over and Ego has been looking for Peter ever since. Gamora and Nebula reunite and fight but semi-reconcile when they discover a dark secret hidden in caverns on Ego’s planet. Mantis also knows much more than she reveals. Will Quill and dad Ego ever be true family or does Ego harbor a horrible secret? Will Quill/Star Lord use his newfound Celestial powers? 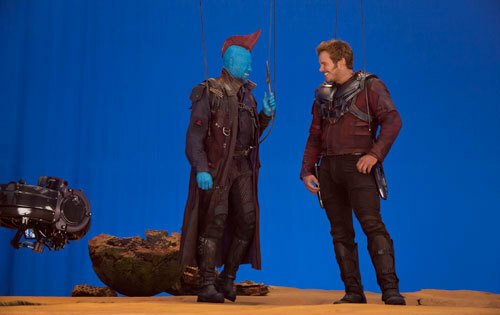 Will Yondu be accepted back into the Ravagers and will Nebula and Gamora ever bond as sisters? 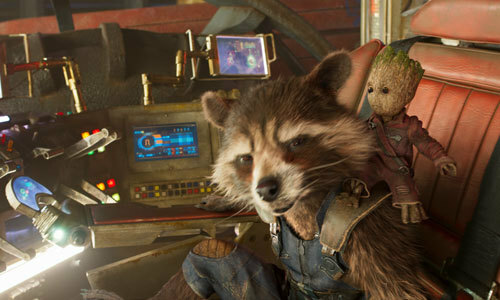 Will Rocket, Yondu and Baby Groot rejoin the other Guardians? Will Ayesha and her Sovereign ships attack again? The Blu-ray contains a bunch of fun extras! 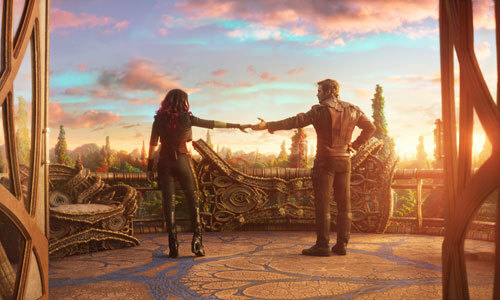 The four-part “Making Of” featurette Bonus Round: The Making of Guardians of the Galaxy Vol 2 is comprehensive. “In The Director’s Chair with James Gunn” features behind-the-scenes shots with everyone from actors to tech people talking about how fun and great their director is. 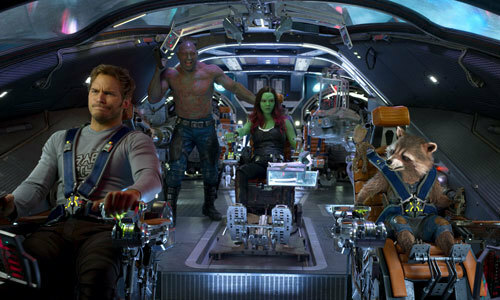 “Reunion Tour: the Music of Guardians of the Galaxy Vol. 2” features Gunn telling us why he picked each song and just how much music is a part of what makes these movies successful. He even writes it into his scripts. “The movies help these classic songs carry on”. Very interesting and entertaining. “Living Plants and Talking Trees” The Visual Effects of Vol. 2” presents the SPFX wizards talking about the look of the film. We see great concept art paintings and hear about different looks for the many different cultures in the movie. We see techs rigging for trees to blow on set etc. Really nice extra. In “Showtime: The Cast of Vol.2” we get to see the actors working and goofing off on set. We learn where the Guardians are emotionally in this sequel and that Chris Pratt makes everyone laugh. 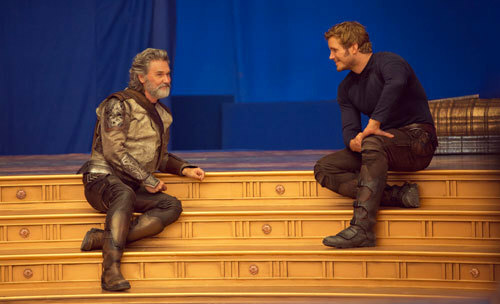 We see him interacting with Kurt Russell and learn why Russell was cast, etc. Lots of fun! We get a wacky music performance called Guardians of the Galaxy “Inferno” Music Video which looks pure 1970’s; crazy space costumes with David Hasselhoff being frontman while various cast members and Marvel icon Stan Lee pop up unexpectedly. A hoot to watch. Gag Reel – Never get enough of these. This one is short but funny. Sly Stallone has one heck of a time trying to say “Raveger” or is it “Ravenger”? Kurt keeps saying Star Wars instead of Star Lord.. a good chuckle. Deleted Scenes – some are funny and others touching – Well worth a watch. 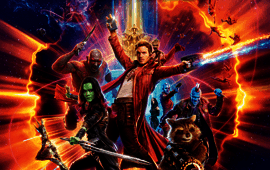 Audio Commentary by director James Gunn includes comments on what we see on screen in detail plus info on what he went through to make it work. Well worth a listen. Guardians of the Galaxy Vol. 2 was the ultimate eye-candy plus a heartfelt exploration of how friends in your life might be as or more important than blood relatives. The story wasn’t earth-shaking otherwise but nobody cares. You will be massively entertained by the cast and the colorful, imaginative effects. Baby Groot is his own wonderful attraction. This Blu-ray/DVD/Digital set is certainly worth adding to your collection or gifting. Extras cover a wide variety of on and off set subjects and we get both a goofy gag reel AND the wackiest music video you will have seen in a while. The combination of plenty of extras from the actors as well as a great looking and sounding set makes us go five stars! Buy Guardians of the Galaxy Vol. 2 in stores August 22nd! 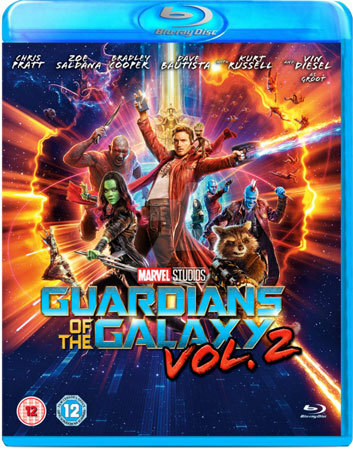 Are you up for adding this “Guardians” sequel to your collection? What do you like and dislike about the film as a sequel? Comment below!